In early February, I spent the day with some great young classical musicians, making portraits of them individually and as a group for the Sydney Symphony Orchestra Fellowship programme. 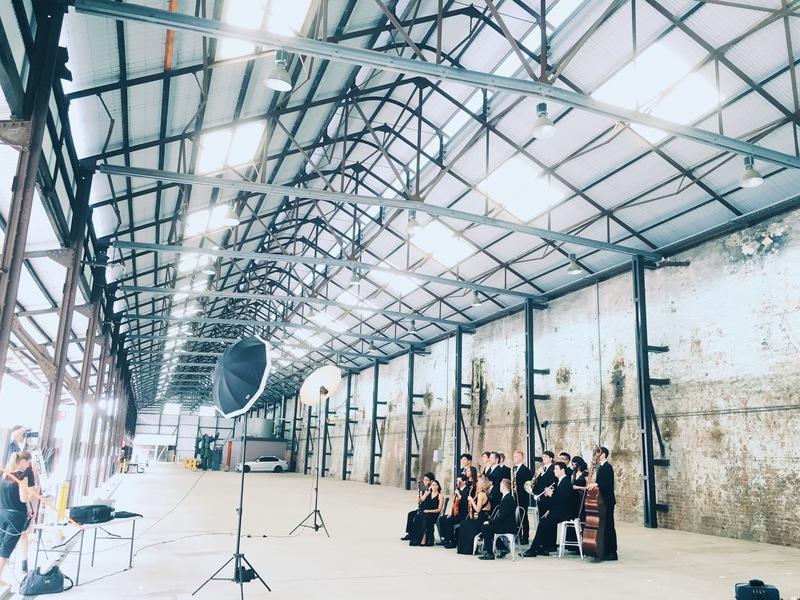 These are the best of the best, young Australian talent who have been chosen to spend a year in the company of the country's top orchestra, working together as a chamber group, attending masterclasses - and, of course, playing with the orchestra as well. 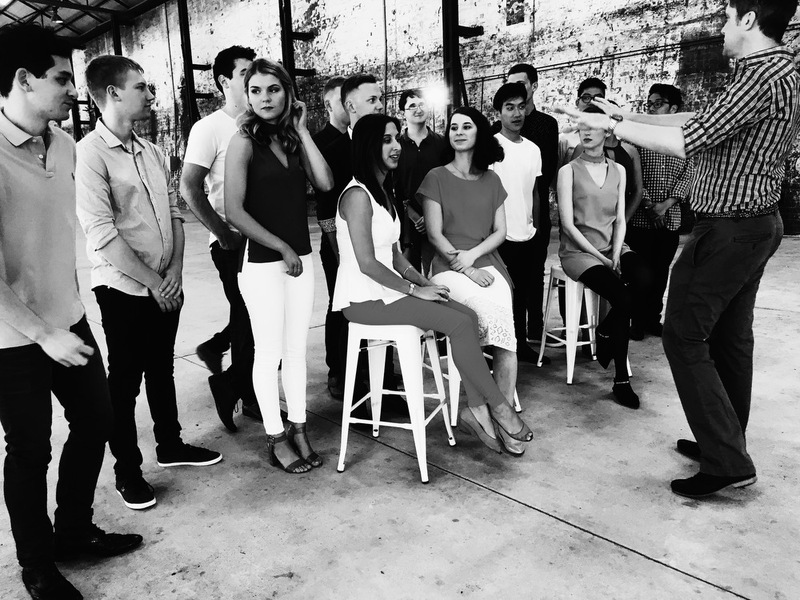 I actually knew a couple of them already, as we'd done a shoot together before - with the Sydney Youth Orchestra a couple of years ago - so it was nice to see their careers progressing in the city, as they make their way into larger and more prestigious company. Of course, a shoot like this doesn't just happen on the day - we'd been discussing and planning it for a few months, scouting various locations before settling on Carriageworks. The venue we decided on was their Blacksmith's Workshop - which has great character, but is essentially an open-air venue, which on the one hand gave us a certain amount of natural light, but given that the brief included portraits against a backdrop, it also meant building a studio on location. Not a problem! One backdrop and a range of lighting later, we were set to go. Kate from You Beauty set up a makeup table and worked her magic on everyone, and we got underway; and as you'll see in the images below, you can't detect the fact that we were outside - where the Saturday markets are usually held...! From a technical perspective, it just meant for the individual portraits I set up the lighting so that the daylight had no real effect on the images; that way, as the sun moved over the course of the day, we could keep a consistent studio setup going. The schedule was fairly tight for the day, with 16 young performers needing portraits both with & without instruments, plus three separate setups for group portraits, each of which needed to be arranged & lit in a short period of time. At one point, we had to break up the portrait studio to use the lights for a group image, then put it all back together and carry on with portraits! But with good planning (and fast setup), we got everyone done and finished on schedule - and most importantly, the musicians look great, and the folks at the SSO are happy. The nice thing about working on a bigger shoot is, of course, you sometimes have an assistant who can take a few behind-the-scenes production photos. So, with thanks to Oscar Colman, here's a glimpse of the making of the shoot! To me, the best part of all was going to a concert of Beethoven by the full Sydney Symphony Orchestra under the baton of music director Vladimir Ashkenazy just a week later, and seeing six of the Fellowship on stage with him - ah, they grow up so fast, don't they? Sign up for weekly news & updates!